I put my excess 10 sets of Wimas for sale in the Black Market . Can someone verify that my quantities are correct? All electronics are selling Nichicon PB series 47uf 450V for $1 each. It would be very helpful (for me, at least) to have the standard type tube gear voltage readings, at the resistor drop points. 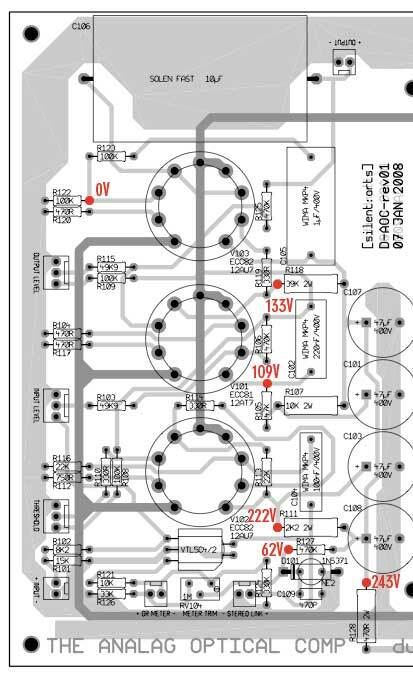 Can someone with a working unit please post the B+ voltages at R128, R127, R123, R118, R111, and R105? This would be most appreciated! What is the minimum power rating for the 39v Zener diodes, D6,D7,D8? What is the regulated HT voltage for the D-AOC ?? "]with 470R + 47R resistors (silkscreened values) I get 238V after Rx28, close enough. does anyone have one up and running yet that can take voltage readings? was a little hard to do, since all my tools and flukes etc are in a studio I'm building at the moment. All voltages seem to be ok according to the voltages as in pic above. I have edcor trafo's, solen caps etc, tubes light up, voltage is set to 6.3v etc. Yep, exactly the same.. even the leds blink at the same speed when i link 'm together. What is think is strange is that there is no sound coming through at all. blinking could indicate oscillation, I think. but forget the sidechain at the moment, first you need some sound coming thru. Remove the sidechain tubes (VX02), and trace the input signal to see where it gets lost. - maybe the Input/Output pots are connected the other way round? - is there a signal before the output transformer? - bypass the relay boards (if you used them) and connect XLRs directly to the main pcb. Mmmmh, otherwise? One channel is allready working now and sounds nice!